Tired of feeling like second-class citizens next to Apple Pay, contactless mobile payment pioneers Google Wallet and Softcard have teamed up with three of the nation's largest wireless carriers. The Google Commerce Blog today announced plans to ramp up adoption of Google Wallet, the near-field communication (NFC) based mobile payment technology first introduced in 2011. Rather than attempt to compete with carrier-backed rival Softcard against the Apple Pay behemoth, Google has chosen to partner with the service formerly known as ISIS Mobile Wallet. A joint venture between US carriers AT&T, T-Mobile and Verizon Wireless, Softcard will relinquish "some exciting technology and intellectual property" to Google Wallet, which will soon come preinstalled on Android 4.4 KitKat or higher smartphones sold by the three carriers. Having Google Wallet already installed on new Android handsets could presumably go a long way toward fending off Apple Pay, which is baked right into iOS 8.1 on Touch ID-enabled iPhone 5S, iPhone 6 and iPhone 6 Plus smartphones, as well as the iPad Air 2 and iPad mini 3. 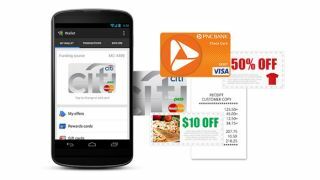 The move also gives Google Wallet a whiff of legitimacy, given the service has a somewhat checkered history with US carriers (we're looking at you, Verizon) who favored their own competing Softcard technology. The announcement specifically singles out the "tap and pay functionality" of Google Wallet will be a big part of the mix when AT&T, T-Mobile US and Verizon begin offering the app preinstalled on Android devices later this year. In the wake of Apple Pay's launch last fall, Google Wallet and Softcard also faced setbacks as major US retailers such as CVS and Rite Aid blocked all three tap-and-pay services from stores in favor of a fourth competitor known as CurrentC, which has yet to hit the market. Get the latest on the upcoming Samsung Galaxy S6 right here!